I have been fortunate to enjoy a good bit of commissioned work lately, and each one is unique. The reasons behind and the relationships that form over the planning of a painting show through somehow and the work is better for it. Before the first mark is placed on the canvas, the painting already has a story. I’m obviously partial to dogs. Whether the subject is animal portraiture or a hunting scene, it all starts with good composition and usually at least one quality photograph, either yours or mine. After discussing details of subject matter, size, etc. I can give a firm price on your painting. 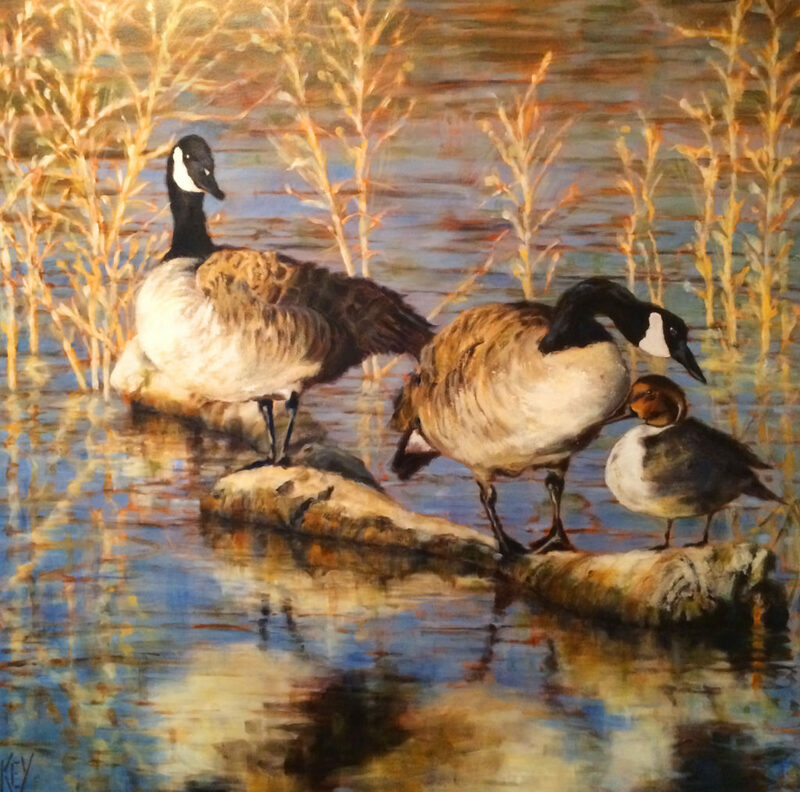 A 50% deposit then holds your “place” in my painting schedule and at that time I will give you an estimated completion date. I’m happy to discuss, please email your ideas! WHOA – 30X60. Axel (German Short Haired Pointer) and Panzer (Drathaar) flushing a Mississippi covey. Panzer was one of those once in a lifetime dogs whose hunting days were cut much too short. 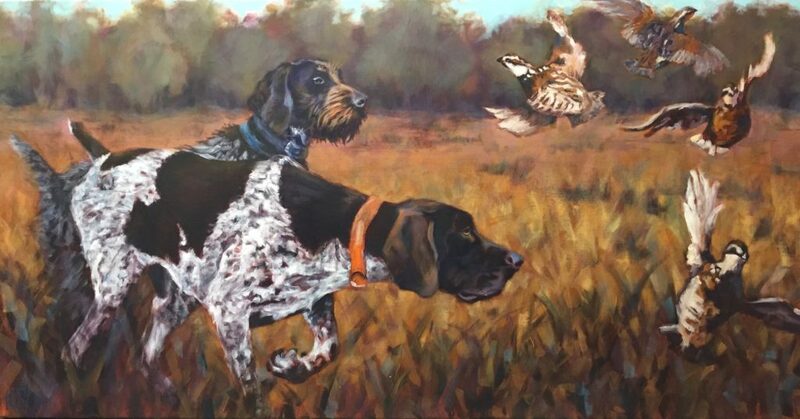 This painting honors him by showing him honoring Axel’s point, backing his buddy up, but always keeping an eye on the prize. 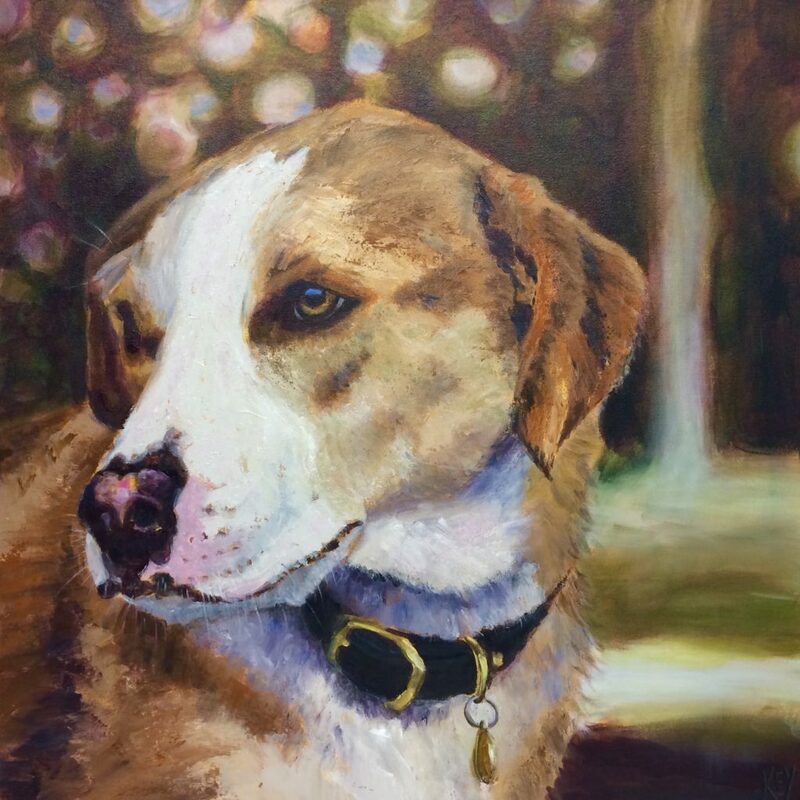 GRACIE – 24X20. 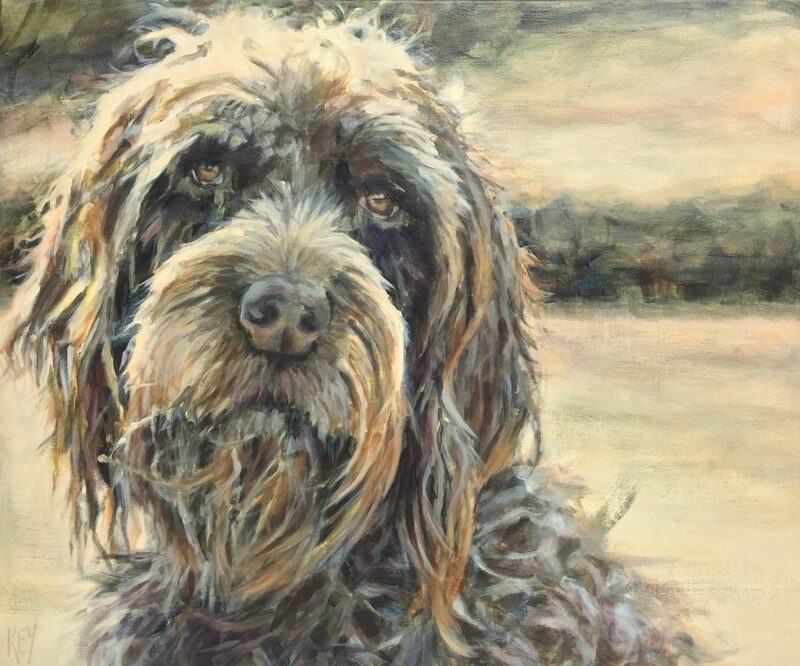 A Wire Haired Pointing Griffon, comical and sweet. I was able to see where the painting would go, so I knew to play off the dark khaki greens and creams of the fabrics, along with the warmth of the wood tones in the room. Her “bed head” is entirely appropriate… she hangs in the master’s bedroom. 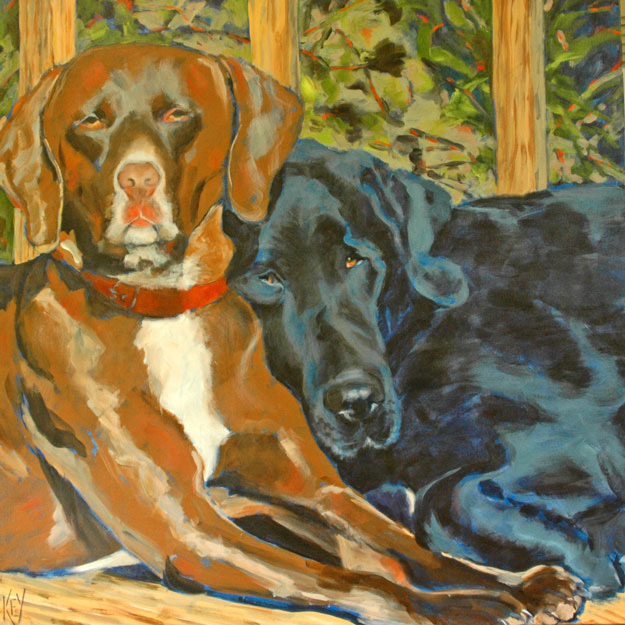 SLEEPY HEADS – 36X36. Baby the German Short Hair was always moving and rarely still. Paddy the Lab was always still and rarely moving. Together they would sleep in the sun. 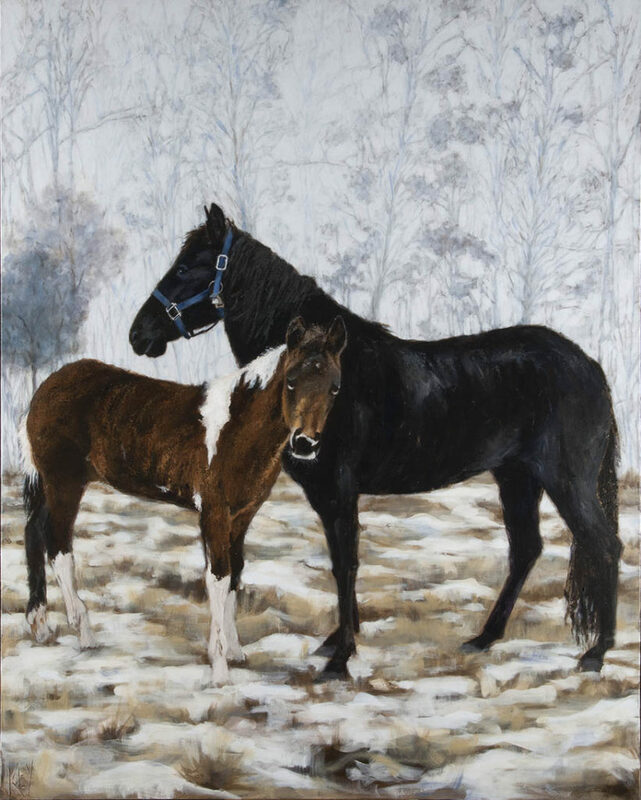 BEASLEY’S HORSES – 60X48. A classic Tennessee Walker, the colt pictured in this mother and son portrait grew up to win numerous ribbons in Alabama, Tennessee and Kentucky. “Generator’s Cloud Chasers Idol” (aka “Bubba”). AND GOD SAW THAT IT WAS GOOD – 30X30. Canada Geese and a random little Red Head. Painted for the lakehouse of a priest and his wife (my neighbors and friends), I had the title “love thy neighbor” on my mind the whole time I was painting it. I like the priest’s title better. SULA TIME – 20X24. 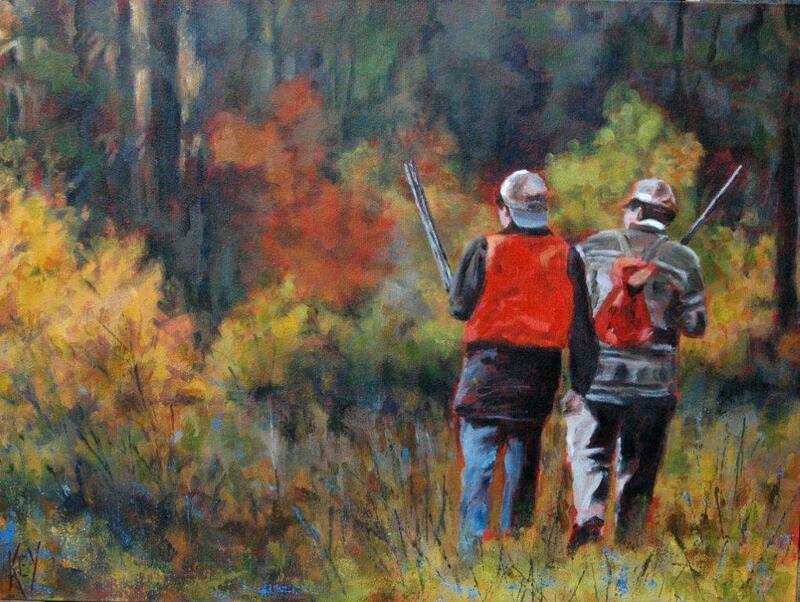 The father and the son who hunt together, stay together. I am thankful my husband knew the value of spending time outdoors with us. This was a lazy fall day in Montana, walking around, looking for what was there, maybe even a grouse. COW ROCK – 40X40. 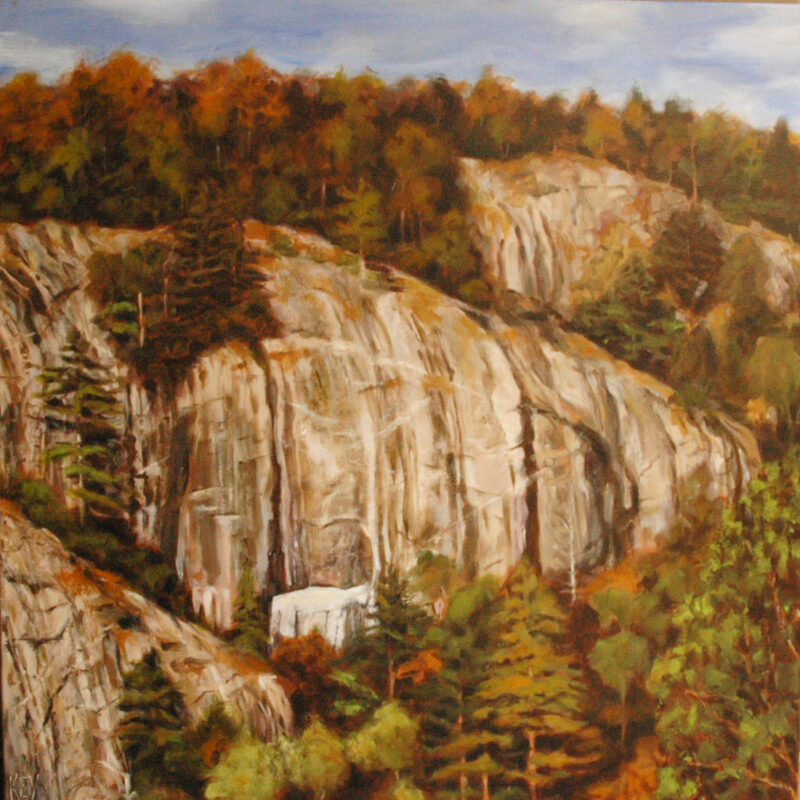 Lonesome Valley, in Cashiers, NC, is the largest box canyon in the East, and is framed by two granite mountain walls. One wall has a natural outcropping of white rocks known by locals as “cow rock”. The gentleman who commissioned this piece enjoys it in his mountain home there.